War was a splendid affair for Maori - to die in battle was noble, and to gain revenge for previous insult or defeat was also noble. To eat an enemy, to drink his blood, to preserve his head, to use his bones for fish-hooks, or at the very least to enslave him - any means to steal his prestige - were also noble and desireable. These battles were seasonal, beginning after the crops were planted and ending before harvest. This summer period was dedicated to Tu, the God of War. 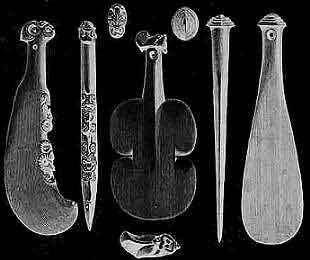 Spearheads were made from the wood manauka, rimu or kahikatea - the tewhatewha, with axe-like top had feather ornamentation. A vicious handheld weapon was a flesh ripper - a carved piece with shark's teeth set into it, as a blade. The more common handheld weapons, or patu, above, were wooden, stone or in exceptional cases, greenstone or pounamu. Mana was a quality that imbued many aspects of Maori life - and most importantly, themselves as people. Mana is another word that is difficult to anglicize, but can mean in different circumstances, honour, prestige, authority, psychic power, influence, skill, or nobleness. Mana could be lost, or gained, and battle was a perfect arena for the loss and gain of mana, for the victor and defeated. Mere of valuable pounama that might have been handed down from generation to generation had such high levels of mana that prisoners might request to be killed by such a weapon. A great deal of mana was instantly bestowed on the first-born of a leading or chief's family. 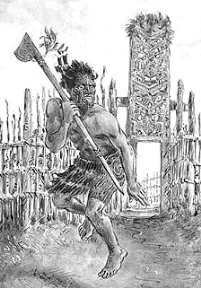 In war the iwi or the hapu were led by a chief (ariki) who had the most mana, but he would lead from the front - he had to show true fighting spirit by example. The concept of chivalry in battle, as the Pakeha understood it, was not known to the Maori - he had his own rigorous ethical code. In battle, a warrior sought mana which gave him a ferocity beyond simple duty - and a great deal of pragmatism. "After our defeat at Rangiriri, overures of peace were proposed to us .. to sue for peace is a confession of weakness..we invariably treated all these offers with contempt. Numbers of times the Pakeha sent heralds of peace to us"
If possible, it was better to live, but it was better to die with mana than to live stripped of it. The time-honoured methods of waging war however, hit and run, hand-to-hand, and fierce individual duels were no match for the muskets that Pakeha introduced.